Check out the following Easter Cupcake ideas for some fun holiday designs. You can try your hand at making fondant characters to top your icing, but also know that you can incorporate Easter candies and decorations to make some adorable and unique desserts. The cute Easter bunnies that top the cupcakes pictured here are made from a combination of fondant icing and piped buttercream frosting. Double the sweetness quotient of your cupcakes by topping them with Easter egg cookies. Roll the cookie dough thin before cutting out egg shapes. Cool after baking, ice the cookies, and add a variety of piped accents. No two cookies have to look exactly the same. Once the cookies' icing has set, use them to decorate the cupcakes. Add a thick layer of frosting to the cupcakes, dip them in colored coconut, and sink a cookie into the top. You can add a squirt of buttercream behind each cookie to help prop it up. To make this cute design, use a multi-hole grass tip to add buttercream icing to the top of your cupcakes. Before the icing sets, add three candy eggs to the center and push them in slightly to anchor them. This is a fairly easy design that makes a great visual impact. Just imagine a tray filled with these cupcakes on your holiday table! This simple design uses small plastic Easter egg decorations as toppers. Use a large star tip to create a decorative swirl of icing on your cupcakes. You can stripe your decorating bag with gel coloring before adding your buttercream, or you can airbrush the top of the frosting if you're practiced with that technique. Simply push the egg decorations into the top of the frosting ,and you're finished. Just make sure your guests realize the eggs aren't edible and that children remove them before eating. This is another quick and easy design. Use a star tip to pipe a circular mound of icing on your cupcakes, and top them with a white chocolate Easter chick. 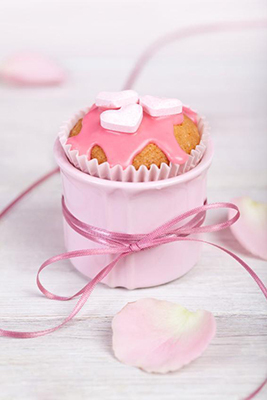 If cute bunnies and Easter eggs aren't your style, consider decorating your cupcakes with lovely flowers for a spring-like design that is totally appropriate for the holiday. Roses are always a favorite, but you can also try your hand at daisy-style flowers in any color combination you like. To make the blue daisies, tint your buttercream petal icing blue, and then tint your center icing in a complementary color such as yellow. Use a Wilton #104 tip to make the outer ring of petals, piping from the edge to the center. Pipe a second, smaller ring of petals over the outer ring, and use a Wilton #5 tip to pipe the dot in the center. The pastel colors used on these cupcakes are also in keeping with a spring Easter theme. Use an open star tip to add a large swirl of icing to the top of the cupcakes. You can then top them with premade butterflies made from royal icing, which are available at most cake decorating shops, or you can try your hand at piping your own butterflies using round tips in various sizes. Allow the royal icing to dry thoroughly, and then your edible decorations are ready to add to your cupcakes. Peeps are one of the most recognizable Easter candies, and they make simple yet adorable cupcake toppers. Bake your cupcakes in bold-colored wrappers, ice them with white buttercream, and gently push Peeps of different colors into the icing. You'll have a colorful display to dazzle children and grownups alike. This last design features a cross and the Greek initials that stand for "Christ Is Risen." To recreate this design, frost a cupcake smooth with buttercream, and roll the entire edge in colorful nonpareils. Use a #1 Wilton open decorating tip to pipe a simple cross, the XB, and some flourishes on either side. Whether you choose a religious design or something more whimsical, Easter cupcakes can brighten your holiday table and add a special touch to your celebration.